Book Description: In this unique volume Judith Abrams, author of the highly regarded series The Talmud for Beginners, examines the episodes recorded in rabbinic literature that suggest the actions of the women of those times. 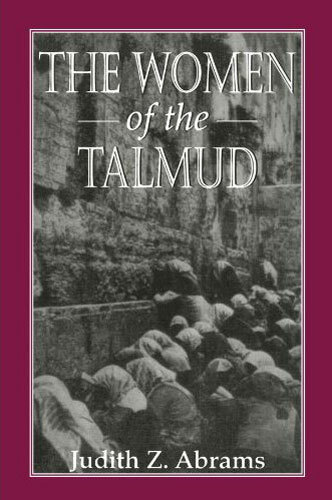 By overlooking what the sages thought about women, or what they believed women ought to do in theory, and by focusing upon the situational and behavioral patterns of these women, Abrams has constructed a credible and feasible account of what women belonging to the rabbinic era were actually like and the manner in which they conducted themselves on a daily basis. Upon looking at the materials presented, the reader will find that women were every bit as varied a group then as women are today; some were pious and respectful of the sages and some disregarded them; some were poor and others rich; some longed to be married while others yearned for divorce. Perhaps the greatest surprise to the reader will be discovering the large amount of power and control women had over their own lives. Far from passive, these women were not the powerless figures the reader may have thought them to be.